India, the subcontinent rich in culture, is home to over a billion people who speak over one thousand dialects and are members of over ten different religions. Hindus, Muslims, Christians and others all speaking variations of Hindi, Punjabi and Urdu all residing in one great country - the largest democracy in the world. The ancient Indus Valley civilisation originated here, and since then, the region has always been a fascinating mix of cultures. From the wintry Himalayas of northern India to the sublime beaches of Goa, there's a beautiful haven for travellers of all tastes seeking a bit of zen or nirvana. The famed Ganges River certainly is a sight to behold, even just for the millions of people who crowd it, believing in its holiness. That said, the people themselves offer enough of a reason to travel: Indians are extremely hospitable, incredibly diverse, and just as fascinated by tourists as tourists are intrigued by them. The true beauty of this country lies in its people. The convergence of so many different castes, customs, religions and languages makes India truly and uniquely chaotic. Because it is home to 800 million Hindus, cows roam freely in the streets - but while sitting in a rickshaw waiting for a herd to move, you may well see black burka-clad Muslim women strolling by. Though India has one of the fastest growing economies in the world, Indians maintain a simple life - outdoor markets, neighbourhood parties, and sitting outside sipping on mango juice. For those fed up with fast-paced capitalism and materialism, India is the perfect destination, offering a reality check on what matters in life to boot! British tourists are required to have visas to visit India, obtainable from UK consulates and embassies for India. Always travel with several copies of your passport - such theft is rising in the country. Also make sure you have comprehensive medical insurance and keep a copy of your policy with you. Indian public hospitals and medical services are generally of lower quality than in the UK. Recommended vaccinations include Hepatitis A, Typhoid and Polio, but you should consult your GP for an authoritative opinion at least eight weeks in advance. Because India is so large and so diverse, there are different pointers for every region. Internet and book research is essential for knowing cultural differences beforehand, but there are some that are valid for the entire country. Do accept food and gifts when they are offered (even if you're full or up to your arms in presents). Don't flirt brazenly with Indian women as you would in the UK - this is perceived as offensive both by the female and any male family members who might be around. Do bargain with street traders. They will hike prices up for tourists, but they will also be open to haggling. Don't be offended by Indians waving their middle finger at you - it's their natural finger to point with. Do dress conservatively for small villages and rural areas. Don't make light of British imperialism in India, which only ended in 1947. At the same time don't be offended when locals make their own jokes. Sri Lankan politician Colvin R. de Silva famously responded to the well known saying, "The sun never sets on the British empire" with the quip "That's because God does not trust the British in the dark"! Do be aware of pick-pockets. Don't drink the water - remember to never order tap water in a restaurant, always bottled water. Do carry diarrhoea, malaria, and cough medicines with you, as well as strong painkillers. Dharamsala - this town in the northern state of Himachal Pradesh is situated in the lush green Kangra Valley and is a centre of both Hindu and Buddhist religions. It is also the home base of the Dalai Lama and his followers when the spiritual leader is not busy travelling the world. Goa - the smallest state in India is best known for its sunny and beautiful beaches. Just be sure to know what kind of experience you want: private beaches owned by hotels will feature only British and Australian tourists, while public beaches will be crowded with Indians (and offer cheap but safe water sports). 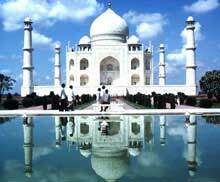 Agra - this city on the banks of the Yamuna River in Uttar Pradesh is home to the Taj Mahal, one of the seven wonders of the modern world and surely the most romantic gift an emperor could build for his wife. Mumbai (formerly Bombay) - on the Indian Ocean, the largest metropolis in India and home to shopping malls and Bollywood movie sets as well as a national park and heartrending urban poverty.